Also known as the Cape hunting dog, the African wild dog is found in the savanna woodlands of sub-suharan Africa. 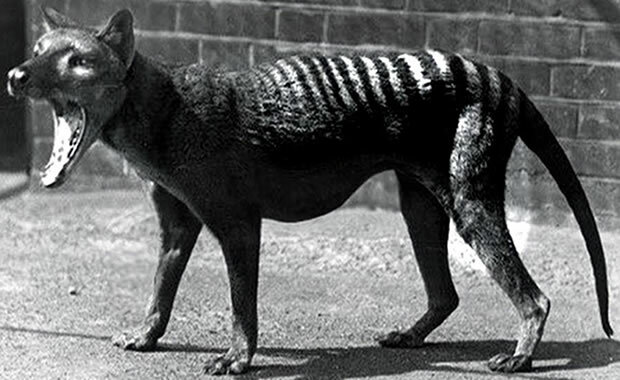 It is a medium-sized canine with a head and body length of 30 to 40 inches and a white-tipped tail that can grow as long as 16 inches. Adults weigh between 40 and 80 lb. Their coats vary in color with blotches of black, white and orange or yellow. These pack hunters are thin and muscular and they have strong and powerful jaws with sharp teeth. They are excellent runners and have excellent vision for catching their prey. African wild dogs live in packs of up to 15 adults together with the young. Each pack has two dominant adults, one male and one female. Usually only the two dominant pair will mate, but all members of the pack take care of the young. These dogs are often regarded as merciless and cruel killers and have a bad reputation, therefore they are frequently killed by humans. Wild dogs breed in the middle of the dry season and females give birth to litters of 7 to over 20 pups. The young remain in underground burrows (previously occupied by warthogs and other animals) and are guarded at all times by one or more of the adults while the others go out and hunt. When the pack returns, the young are fed regurgitated meat by any of the hunters. Diet consists mainly of medium-sized antelopes like impala and gazelles, but wild dogs have also been seen taking on larger mammals such as wildebeest. The population of African wild dogs has declined mainly due to being killed by farmers who consider them a nuisance. African wild dogs sometimes prey on small livestock, therefore resulting in death from being shot or poisoned by the owners. The species is now protected, and it is illegal to kill a wild dog unless allowed by a necessary permit. Copyright Notice: This article is licensed under the GNU Free Documentation License. It uses material from the Wikipedia article "African wild dog". Glenn, C. R. 2006. 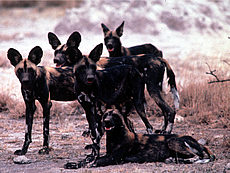 "Earth's Endangered Creatures - African Wild Dog Facts" (Online). Accessed 4/18/2019 at http://earthsendangered.com/profile.asp?sp=125&ID=1. Need more African Wild Dog facts?